Four and one-half months after contract expiration, no agreement has been reached. Local leadership has expressed disappointment with management from Albertsons, Ralphs and Vons. They have made little effort towards achieving a contract that will that provide living wages for all employees, affordable medical benefits, retirement security and fair scheduling. 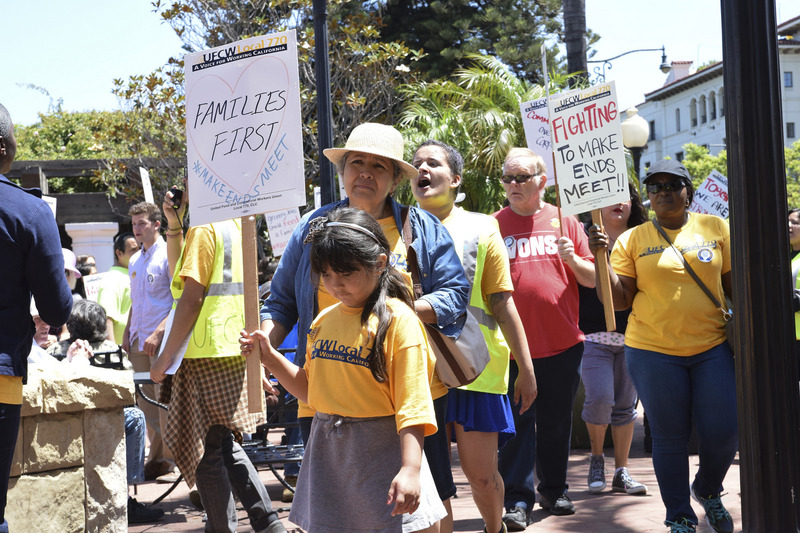 On Wednesday, July 13th, Southern California grocery workers rallied to voice their concerns and demands for a fair contract. The action took place at a Santa Barbara Ralph’s store where hundreds, workers and supporters, turned out in solidarity. Over 50,000 grocery workers working at Ralph’s, Albertson’s/Vons are affected by the ongoing contract negotiations. In June, grocery workers overwhelmingly voted to authorize a strike. Leadership is doing everything possible to avoid a strike, including putting pressure on the companies through similar actions in front of their stores, community and labor delegations and intermittent boycotts. Ultimately, if the companies do not show a willingness to adequately address the issues, they will begin strike preparations including holding picket captain meetings, shoring up their food banks, seeking hardship contributions from unions throughout the country and notifying the public of the likelihood of a strike. Workers deserve to make end meet. Please continue to stay informed for regular updates.